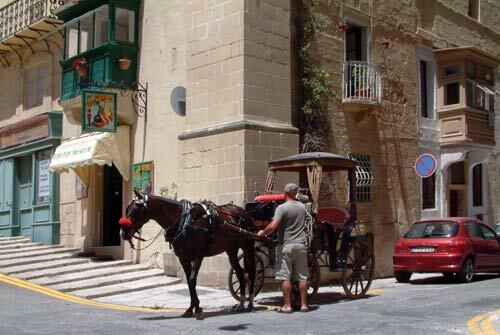 There are lots of horse-drawn carts to use almost like taxis in Valletta. Some are parked under special shelters which provide shelters for the horses or on street corners. There are brilliant for those hot days when your feet are aching after sightseeing and you would like to get to your hotel or another part of the city. This particular horse-drawn cab was waiting outside the Toy Museum in Merchant's Street.